BACKGROUND: Male breast cancers (MBC) account for 1% of all breast cancers. Neoadjuvant concurrent chemoradiation (CTRT) is not the standard of care for treating breast cancer. However, in our center, it has been routinely used in patients with locally advanced breast cancer to downsize the tumor and make it amenable to surgery. AIM: This study was conducted to examine the clinical and pathological profile and outcomes of patients with MBC treated at our institute with neoadjuvant CTRT. SETTINGS AND DESIGN: The study was conducted at a tertiary cancer center and was retrospective in nature. MATERIALS AND METHODS: All MBC patients treated with neoadjuvant CTRT at our center between 2001 and 2016 were enrolled in the study. Data were retrospectively extracted from the patients' case records. STATISTICAL ANALYSIS: Kaplan–Meier method was used for survival analysis and the outcome variables were compared using the log-rank test. RESULTS: Thirty-one MBC patients who received neoadjuvant CTRT were analyzed in this study. The median age of the patients was 53 years. 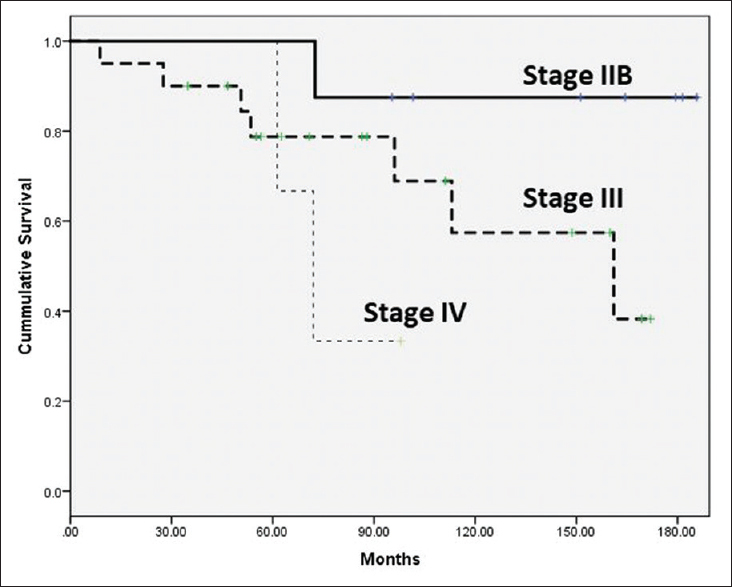 Stage IIB disease was observed in 8/31 (26%) patients, stage III in 20/31 (64%), and stage IV in 3/31 (10%) patients. There was no grade 3 or 4 toxicity due to CTRT. Surgery was performed in 29/31 (94%) patients and none of the patients had a pathological complete response. The median duration of follow-up was 95.3 months. The 8-year event-free survival and overall survival for stage IIB, III, and IV were 75%, 50%, and 0% and 87.5%, 69%, and 0%, respectively. CONCLUSION: This is the first study to report on the use of neoadjuvant CTRT in MBC. Prospective evidence from phase-3 randomized controlled trials on the safety and efficacy of CTRT in breast cancer is required before its routine use can be recommended. Neoadjuvant concurrent chemoradiation (CTRT) has been practiced at our center for the last five decades for treating patients (males and females) presenting with locally advanced breast cancer (LABC). This is because many patients present with inoperable bulky disease that does not respond to NACT alone, and in our experience, we have observed that neoadjuvant CTRT increases the chances of operability and thereby cure. Our center has published the largest retrospective case series on neoadjuvant CTRT in female breast cancer; the study included 1,117 patients and reported a pathological complete response (pCR) in 45% of the patients and 10-year overall survival (OS) and disease-free survival (DFS) in 64% and 53%, respectively. Chemotherapy given concurrently with radiotherapy acts as a radiosensitizer and improves the clinical response and pCR rate compared with NACT alone. Neoadjuvant CTRT also helps in the sterilization of the skin prior to surgery in patients with skin involvement. There is a no published literature on the use of neoadjuvant CTRT in MBC. This study was conducted to analyze the clinical features, pathological features, and outcome of patients with MBC who were treated with neoadjuvant CTRT at our center. We retrospectively analyzed all consecutive MBC patients who were treated with CTRT at our center between 2001 and 2016. Patient details were obtained from the hospital records. Hospital ethics committee clearance was not required as the study involved only a retrospective review of patients' case records. Diagnosis of breast cancer was established with core needle biopsy. Prognostic markers, such as estrogen receptor (ER), progesterone receptor (PR), and human epidermal growth factor receptor type 2 (Her2neu) were analyzed on the biopsy specimens using immunohistochemistry (IHC). Data regarding patients' ER, PR, and Her2neu status were analyzed as entered in the case records. Staging workup done for all patients included chest X-ray, ultrasound of the abdomen, and pelvis and bone scan. Additional imaging such as computed tomography (CT) or magnetic resonance imaging (MRI) was done if there was suspicion of organ involvement by metastasis. The stage of MBC was as per the appropriate TNM classification at the time of the diagnosis (American Joint Committee on Cancer, 6th and 7th editions). Treatment decisions for patients were taken by the hospital's multidisciplinary breast cancer tumor board. Till 2006, all LABCs at our center were treated with neoadjuvant CTRT. After 2006, patients with inoperable LABC were treated with CTRT and patients with operable LABC were treated with NACT or upfront surgery. Few patients with early breast cancer (Stage IIB) disease also received neoadjuvant CTRT as they were clinically node-positive or had a T3 or T4-sized tumor and would have otherwise received postoperative adjuvant radiotherapy. The chemotherapy regimen consisted of 5-fluorouracil: 600 mg/m2, cyclophosphamide: 600 mg/m2, and epirubicin: 60 mg/m2 (FEC-60) given every 3 weeks or cyclophosphamide: 600 mg/m2, methotrexate: 50 mg/m2, and 5-fluorouracil: 600 mg/m2 (CMF) given every 3 weeks. All chemotherapy drugs were given intravenously. A total of six cycles of chemotherapy were given. Radiotherapy with FEC-60 or CMF was incorporated during the second or third cycle of chemotherapy. The study included patients treated over a 16-year period; there has been an evolution in the practice over the years. The availability of new chemotherapy drugs and the institutional practice of using specific chemotherapy drugs for treating breast cancer during this period influenced the choice of chemotherapy regimen for CTRT. CMF was the preferred chemotherapy regimen for CTRT till 2004, when it was replaced by FEC, and since 2016, we have been using paclitaxel. The dose of external beam radiation was 40 Gy given at 200 cGy per fraction per day for 5 days a week. Radiation was given to the involved breast, axilla, supraclavicular, and internal mammary nodal regions in patients with LABC. Patients with stage IV disease with oligometastatic bone lesion were treated with curative intent similar to LABC patients. The radiation technique used was either a conventional two-dimensional radiation technique using the simulator or three-dimensional conformal radiation using a CT planning system. The decision to operate a patient after completion of CTRT was made by the treating surgeon based on the clinical response to the treatment. Patients who were operated soon after completion of CTRT were given the remaining cycles of chemotherapy postoperatively. The patients in the study were enrolled over a 16-year period, which had an impact on their management as the staging system, ER/PR/Her2neu receptor assay, chemotherapy protocols, and radiotherapy techniques have changed or evolved during this period. None of the Her2neu receptor-positive (IHC 3+ or FISH-positive) patients received anti-Her2neu directed therapy as they could not afford the high cost of the treatment. Patients who were ER-positive received 5 years of adjuvant Tamoxifen. Event-free survival (EFS) was calculated from the date of registration to the date of relapse or progression or death. OS was calculated from the date of registration to the date of death or last follow-up. All patients were censored for survival analysis at the last follow-up or death whichever was earlier. EFS and OS were estimated using the Kaplan–Meier method and variables were compared using the log-rank test. Statistical analysis was done using SPSS software (IBM, SPSS Statistics, version 16.0). MBC was diagnosed in 80 of the 12,000 (0.6%) patients diagnosed to have breast cancer during the study period. In total, 31 patients were treated with neoadjuvant CTRT during this period. The median age of the patients was 53 years (range: 33–65 years). All patients were married. Stage IIB disease was observed in 8/31 (26%) patients, stage III in 20/31 (64%) patients, and stage IV in 3/31 (10%) patients (all had oligometastatic bone involvement). Among the 20 patients with stage III disease, 4 patients had stage IIIA disease, 15 had stage IIIB, and 1 had stage IIIC. Invasive ductal carcinoma (IDC) was the pathology seen in all the patients. ER positivity was seen in 20/31 patients (64%), PR positivity in 22/31 (71%) patients, and Her2neu positivity in 4/31 (13%) patients. Triple-negative breast cancer was seen only in one patient. One-third of the patients had comorbidities in the form of hypertension and/or diabetes. One-third of the patients analyzed had a history of smoking and alcohol intake. CTRT was tolerated well and there were no major treatment-related morbidities in the form of grade 3 or 4 neutropenia, and no grade 3 or 4 skin reactions were seen with CTRT. All patients had grade 2 skin toxicity. There was no interruption of chemotherapy in patients receiving CTRT due to toxicity. 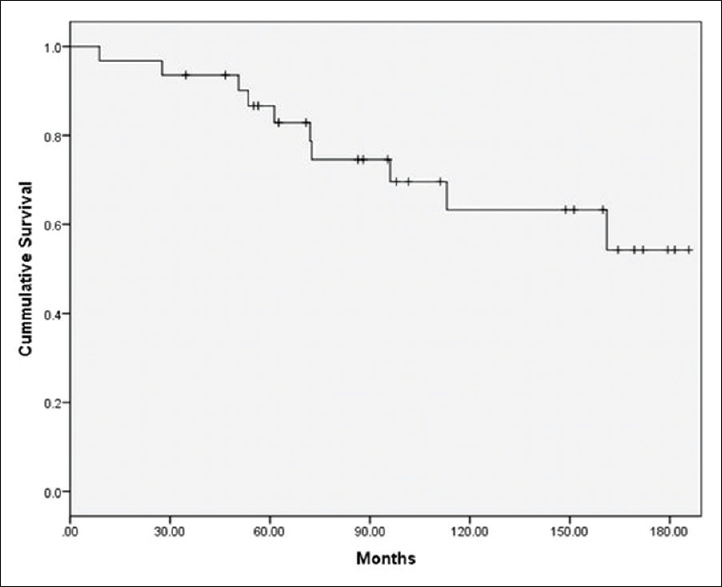 CMF regimen was used in 13/31 (42%) patients, and the remaining 18 patients received FEC-60. Modified radical mastectomy (MRM) was performed in 29/31 (94%) patients, 1 patient with stage IIIB disease was not willing to undergo surgery and another patient with stage IV disease was not considered for surgery due to disease progression. Among the patients who underwent MRM, none showed a pCR. The median duration of follow-up in this study was 95.3 months (range 8.8–186 months). There were no treatment-related deaths. The 8-year EFS and OS for all stages were 51.7% and 69.7% [Figure 1], respectively. The 8-year EFS and OS for stage IIB, III, and IV were 75%, 50%, and 0% and 87.5%, 69%, and 0%, respectively [Figure 2]. Diabetes, hypertension, smoking, and alcohol intake were not significantly associated with OS. None of the study patients were detected to have pulmonary morbidities or cardiac morbidities or second cancers due to CTRT on follow-up physical examination. However, specific laboratory tests or imaging were not performed on follow-up for screening long-term toxicities due to CTRT. Usually, MBCs present in advanced stages and in our study also 64% were stage III cancers. The reason for the advanced stage at presentation is mainly minimal breast tissue in males. Usually, skin infiltration or muscle and chest-wall fixity are common at presentation, which makes such cancers inoperable. It was very interesting to note that almost all the patients in our study were hormone receptor positive and only one patient had a triple-negative tumor. According to the literature review, MBCs are usually hormone receptor positive but triple-negative tumors are also seen in around 10%–15% of the cases. In our study, we did not observe pCR in any of the patients post-neoadjuvant CTRT, which is in contrast to the pCR rates of 17%–45% reported in female breast cancer patients receiving neoadjuvant CTRT. Patients with triple-negative breast cancer and those with Her2neu-positive disease receiving trastuzumab have higher pCR rates than those with ER/PR-positive breast cancer. None of the patients with Her2neu-positive disease in our study received trastuzumab and only 1/31 patients had triple-negative disease; this could be one of the reasons why none of the patients achieved pCR in our study. We used a lower dose of 40 Gy while delivering CTRT instead of the conventional external beam radiotherapy dose of 50 Gy used in the adjuvant post-MRM setting due to the anticipated increase in toxicity with CTRT. The chemotherapy regimens used in CTRT studies in the literature have been 5-fluorouracil, capecitabine, or paclitaxel.,,,, Use of adriamycin chemotherapy concurrent with radiation has been reported in the study by Shantha et al. Woodward et al. reported outcomes on the use of CTRT in 32 female patients with inoperable breast cancer after chemotherapy, residual nodal disease after definitive surgical resection, unresectable chest wall, or nodal recurrence after a prior mastectomy. They used capecitabine (825 mg/m2/once or twice a day) concurrent with radiation given at a dose of 45 Gy and observed nonskin grade 3 toxicity in 54% of the patients. Brackstone et al. reported outcomes in 32 female patients with LABC treated with neoadjuvant CTRT. They used FEC-100 (100 mg/m2 epirubicin) followed by docetaxel 35 mg/m2 weekly concurrent with radiation given at a dose of 50 Gy. They observed a pCR rate of 22% in comparison to 14% with matched controls who received NACT. Grade 3 pneumonitis and grade 3 skin toxicities were observed in 25% of the patients. Three patients in the study had an oligometastatic disease (solitary bone metastasis) at diagnosis who were treated with curative intent as some patients with oligometastatic disease can have long-term survival when treated with curative intent addressing both the locoregional disease and systemic disease. The major advantages of CTRT over sequential chemotherapy followed by radiotherapy are as follows: shortening of the total duration of treatment, higher pCR, and making large tumors that do not respond to chemotherapy alone amenable to surgery. Neoadjuvant CTRT in breast cancer is practiced by very few centers in the world; it is not evidence-based and is not the standard of care for treating breast cancer. To address the lack of prospective data with CTRT in breast cancer, we are currently recruiting patients for a phase-3 randomized controlled trial comparing neoadjuvant CTRT with FEC versus NACT with FEC in females with LABC (CTRI/2014/12/005239). The trial was initiated in 2014 and should complete recruitment in the next 5 years. We are also conducting a prospective observational study on neoadjuvant CTRT with paclitaxel in female LABC patients not eligible for the phase 3 trial. The studies have been approved by the Institute's ethics committee. The major limitation of our study is its retrospective nature, the small number of patients, use of nonevidence-based treatment, arbitrary treatment decisions, patients with Her2neu-positive disease not receiving anti-Her2neu-directed therapy, and heterogeneous treatment of patients due to inclusion over a 16-year period. Important information like treatment toxicities may not have been captured adequately. CTRT as a modality of treatment is rarely used in breast cancer and is considered experimental by most oncologists. Prospective studies with larger number of patients are required to establish the role of neoadjuvant CTRT in breast cancer. Hopefully, the phase 3 randomized controlled trial from our center should provide a definitive answer to whether CTRT in LABC is effective. All patients receiving CTRT in breast cancer should be treated only in an approved clinical trial. This is the first study to report on the use of neoadjuvant CTRT in MBC. Prospective evidence from phase 3 randomized controlled trials on the safety and efficacy of CTRT in breast cancer is required before its routine use can be recommended. Fentiman IS, Fourquet A, Hortobagyi GN. Male breast cancer. Lancet 2006;367:595-604. Giordano SH, Cohen DS, Buzdar AU, Perkins G, Hortobagyi GN. Breast carcinoma in men: A population-based study. Cancer 2004;101:51-7. Speirs V, Shaaban AM. The rising incidence of male breast cancer. Breast Cancer Res Treat 2009;115:429-30. Hill TD, Khamis HJ, Tyczynski JE, Berkel HJ. Comparison of male and female breast cancer incidence trends, tumor characteristics, and survival. Ann Epidemiol 2005;15:773-80. Cutuli B, Le-Nir CC, Serin D, Kirova Y, Gaci Z, Lemanski C, et al. Male breast cancer. Evolution of treatment and prognostic factors. Analysis of 489 cases. Crit Rev Oncol Hematol 2010;73:246-54. Ouriel K, Lotze MT, Hinshaw JR. Prognostic factors of carcinoma of the male breast. Surg Gynecol Obstet 1984;159:373-6. Chikaraddi SB, Krishnappa R, Deshmane V. Male breast cancer in Indian patients: Is it the same? Indian J Cancer 2012;49:272-6. Shanta V, Swaminathan R, Rama R, Radhika R. Retrospective analysis of locally advanced noninflammatory breast cancer from Chennai, South India, 1990–1999. Int J Radiat Oncol Biol Phys 2008;70:51-8. Mandilaras V, Bouganim N, Spayne J, Dent R, Arnaout A, Boileau JF, et al. Concurrent chemoradiotherapy for locally advanced breast cancer-time for a new paradigm?. Curr Oncol. 2015;22:25-32. Kaidar-Person O, Kuten A, Belkacemi Y; AROME. Primary systemic therapy and whole breast irradiation for locally advanced breast cancer: A systematic review. Crit Rev Oncol Hematol 2014;92:143-52. Skinner KA, Dunnington G, Silberman H, Florentine B, Spicer D, For-Menti SC. Preoperative 5-fluorouracil and radiation therapy for locally advanced breast cancer. Am J Surg 1997;174:705-8. Skinner KA, Silberman H, Florentine B, Lomis TJ, Corso F, Spicer D, et al. Preoperative paclitaxel and radiotherapy for locally advanced breast cancer: Surgical aspects. Ann Surg Oncol 2000;7:145-9. Formenti SC, Symmans WF, Volm M, Skinner K, Cohen D, Spicer D, et al. Concurrent paclitaxel and radiation therapy for breast cancer. Semin Radiat Oncol 1999;9:34-42. Adams S, Chakravarthy AB, Donach M, Spicer D, Lymberis S, Singh B, et al. Preoperative concurrent paclitaxel-radiation in locally advanced breast cancer: Pathologic response correlates with five-year overall survival. Breast Cancer Res Treat 2010;124:723-32. Woodward WA, Fang P, Arriaga L, Gao H, Cohen EN, Reuben JM, et al. A phase II study of preoperative capecitabine and concomitant radiation in women with advanced breast cancer. Int J Radiat Oncol Biol Phys 2017;99:777-83. Brackstone M, Palma D, Tuck AB, Scott L, Potvin K, Vandenberg T, et al. Concurrent neoadjuvant chemotherapy and radiation therapy in locally advanced breast cancer. Int J Radiat Oncol Biol Phys 2017;99:769-76. Cardoso F, Senkus E, Costa A, Papadopoulos E, Aapro M, André F, et al. 4th ESO-ESMO international consensus guidelines for advanced breast cancer (ABC 4). Ann Oncol 2018;29:1634-57.